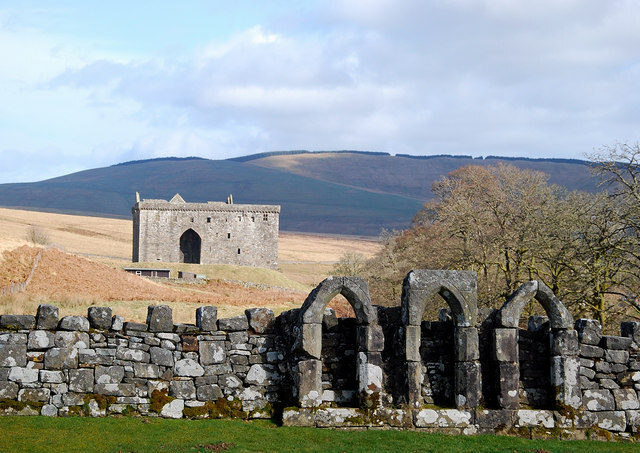 A massive collection of stone, with a heavy cubist beauty, Hermitage Castle sits isolated beside a rushing stream surrounded by bleak, empty moorland. Dating from the 13th century, but substantially rebuilt in the 15th, it embodies the brutal history of the Borders; the stones themselves almost speak of the past. Sir Walter Scott’s favourite castle, it is probably best known as the home of the earl of Bothwell and the place to which Mary, Queen of Scots, rode in 1566 to see him after he had been wounded in a border raid. It’s also where, in 1338, Sir William Douglas imprisoned his enemy Sir Alexander Ramsay in a pit and deliberately starved him to death. Ramsay survived for 17 days by eating grain that trickled into his pit (which can still be seen) from the granary above. The castle is said to be haunted and it certainly has a slightly spooky feel, especially when dark clouds gather. If you have the place to yourself, a visit can be quite magical – it’s one of the best castles to visit in southern Scotland. Hermitage Castle is a must see on your tours of Scotland, contact Ireland & Scotland Luxury Tours now and arrange you personalised tour.